Well, ever the hard worker, she met her goal and added 20 awesome projects to her closet (and home). We thought it would be best to organize them all in one place so you could easily find your next sewing project. Below, we've listed the projects in order. Under them you will find a photo of Laura's completed project and a link to purchasing the pattern and/or fabric (if still available) on our website. Keep in mind that although Laura made a lot of summer-y items, many of the patterns come with longer sleeves or hemlines ideal for any season...especially in the south. Read Laura's review of the Colette's classic Iris shorts pattern. She ended up lengthening hers to make more of a walking short, but these have been made (successfully) time and time again in our store. The pattern is a staple for any wardrobe. Here's the pattern. Fabric is a Khaki Seersucker. The lesson in this pattern was to not judge a book by its cover. Laura chose to ditch the oddly shaped dress pattern and chose the alternate shirt pattern listed on the back. She also subbed out a knit waistband for the cotton one they suggest. Then she went and cut a big hole in it. Not kidding. This review of the Anna Maria Horner Roundabout Dress pattern is a must read even if Laura will never wear this adorable shirt. Laura took a basic knit maxi pattern and made it completely on trend by colorblocking the mid-section. In fact, so much planning went into this dress, it required two blog posts. Read about how to color-block any pattern. Then, read her review of the Jamie Christina Mission Maxi Dress pattern. Here's the pattern. Laura made this with four of our knits. This dress tells the tale of what hemming can do for a pattern. It's intended to be a full length maxi dress but the cover photo of the pattern is so bizarre and distracting you might not give it a second look. With slightly toned down fabrics and a knee-length hem, Laura was able to make an adorable summer dress. Read her review of Serendipity's Studio Madeline Maxi Dress. Here's the pattern. We're out of this fabric, but any of these would be a great alternative. A knit tee is a wardrobe staple for any body, but as you might know, the discount store ones never seem to hold up and who wants to pay an arm and a leg for a tee from the luxury retailers. Read what Laura has to say about why she chose this pattern. Then, read her review on the Sewaholic Renfrew Tee pattern. The pattern comes with a long sleeve version as well as a cowl neck version. Find the pattern here. Find the pink knit here. Five patterns down and Laura was feeling the pressure. Working full time and teaching classes at night, she was looking for an easy sixth pattern. She found this in the Ginger skirt. Read her review on the Colette Ginger Skirt pattern. Here's the pattern and here's the Art Gallery Garden Rocket fabric. At the end of June when Laura wrote this blog, temperatures here in Charleston, SC were pushing 100 degrees and the humidity was through the roof (per usual for a coastal town). So, it's no surprise she chose something breezy and light to help bear the heat. Read Laura's review on the Amy Butler Sun Surf Halter top. Here's the pattern and the gorgeous paisley cotton. With two separates under her belt, Laura was ready for another dress. Feeling good with how her knit turned out, she went for another Sewaholic dress. She initially worried she'd look like a flight attendant, but she ended up loving it...and the price tag. Here's the pattern. Here's the gorgeous navy cotton poplin she used. Things were going really well for her summer project. Probably too well. And, you know what they say. All good things must come to an end. That end came abruptly with the Aurelia Cardigan adventure. She was so excited about finding a cardigan pattern since good ones are so hard to come by. But, alas, it was a bust. In fact, the only one who'd wear it was her dog Shelby and there's pictures to prove it. Read Laura's humbling recount of what went wrong with this Sew Liberated Aurelia pattern. Here's the pattern. Laura used a great grey Bamboo knit and a very lightweight cotton in yellow. Looking for a transitional piece? That's what Laura had in mind when she picked this pattern and its light grey houndstooth fabric. She pictured it with leggings or tights and a long-sleeved layered look for the fall and winter. The high neckline also makes this perfectly appropriate for work. Read her review of the Sewn Square One Go Anywhere Dress. Here's the pattern. We sold out of the houndstooth, but here's some great grey alternatives. Laura like the idea of a layered skirt and the exposed raw edges were just irresistible. And, after she finished whipping that one up, she made another one! The other version is a simple a-line without the layers. Read her review of the Amy Butler Barcelona skirt pattern and how she tackled a mid-calf hem length. Here's the pattern. This is the layered version with the Cameo fabric by Amy Butler. We're out of that now, but this is a close alternative. Here's the basic a-line in a great green eyelet. This next pattern starts a small obsession with a book called Sew What You Love. It spawned Laura's next four patterns and the first has become a beloved baby in the store. We teach this pattern as a class and so many women have been able to successfully make it, which is great since so many people are intimidated by knits. Read Laura's raving review on the Sew What You Love book and this super simple Everyday Tunic knit pattern. Buy the book here. We've sold out of this fabric, but here's some of our other great knit/jersey options. Lots more in store, too. Looking for another easy knit project? Laura was and so she gave the Go To Dress from Sew What You Love a try. Knit dresses are a dime a dozen at stores like Old Navy but just like the Renfew Tee (above) it's very hard to find an affordable option that doesn't fall apart after one wash. Read Laura's review on the Go To Dress from Sew What You Love. Get the book here. See some of our great knits here. 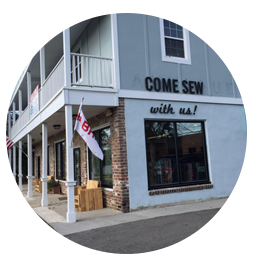 Sew What You Love does not just have women's fashions. It is full of fun projects including an ottoman that Laura had to have for her sitting area at home. She said from the very beginning of this 20 Patterns in 10 Weeks project that she wanted to spend some of her summer working on her 1960's fixer-upper home. The Apple Pie ottoman allowed her to kill two birds with two stones. Read her review on the Sew What You Love Apple Pie Ottoman. Get the pattern book here. Laura used home dec weight scraps she had from other redecorating projects. If clothing and home projects aren't enough, Sew What You Love also has accessory projects like this Big Easy Sling Bag. As anyone who knows her knows, Laura is an active person. Throughout the summer she tackled this project, she was also training for a half Iron man competition which she went on to finish. So, a little bag to take with her on her less competitive bike rides was the perfect addition to her sewing adventure. Read her review on the Sew What You Love Big Easy Sling Bag pattern. Buy the book here. Laura used the Michael Miller Bicycle Haze fabric with a great aqua chevron by Riley Blake and Down Under grey dots as accent fabrics. Laura almost put this pattern back after she realized her beloved cottons and knits were not recommended fabrics for the shirt. But, in keeping with trying things she normally wouldn't (see the Roundabout entry above) she decided to give it a go and I'm glad she did. It's my favorite thing she made all summer. She has some great tips and advice for sewing with slinky fabrics like charmeuse, challis, and chiffon. Read her review of the Sewaholic Pendrell Shirt and get the tips for successful sewing with difficult fabrics. On a sewing high from making the great charmeuse top Laura should have known her time was coming again. She picked up the Isabelle skirt hoping to make a great go to knit skirt to add to the basics section of her closet. It quickly went wrong and Laura is quick to realize her mistake...fabric choice. It's really the same thing that went wrong with the other failing project of the summer (see Aurelia cardigan above). See her review of the Girlfriend's Clothing Isabelle Skirt and see who in the family ended up with the skirt around their waist. Girlfriend's Clothing Isabelle Skirt in brown bamboo knit and brown elastic. At this point, Laura was stuck between some sewing maniac space and the fact that school would be starting in just two weeks. So, it shouldn't be a surprise that a teacher appropriate dress would fall onto her cutting table. What is surprising is that she chose this dress. But, it turned out to be another case of judging a book (or a pattern) by its cover. Read Laura's review on the Anna Maria Horner Socialite Dress pattern. Anna Maria Horner Socialite Dress in Michael Miller's Secret Garden. After making her way through nearly every pattern in the store, Laura took to the internets for her final two patterns. Jennifer Paganelli is a great fabric designer and you'll find many of her wonderful fabrics in our store. So, it was a no-brainer for Laura to choose one of Jennifer's patterns as well. Read Laura's review of the SisBoom.com Rebecca Shift Dress pattern by Jennifer Paganelli. Get the pattern as SisBoom.com. Here's some of our current Jennifer Paganelli fabric selection. Her final pattern...sigh...went to the internet again. This time it was a tunic. We consistently recommend Sew Liberated's Schoolhouse tunic and teach it for many beginner sewing classes. With this in mind and the success of the Rebecca dress (above) Laura wanted to see how this pattern would compare to the beloved Schoolhouse Tunic. Read Laura's review of the Jennifer Paganelli Schoolhouse Tunic from SisBoom.com. And, there you have it! 20 Patterns in 10 Weeks. The summer of sewing and blogging about it spawned the Sew Happy blog and we are thrilled to have been able to keep it up. We look forward to bringing you much more inspiration for all your future sewing endeavors. As for Laura, she's hasn't sewed since (totally kidding), but is totally enjoying her new wardrobe made with her own two hands.